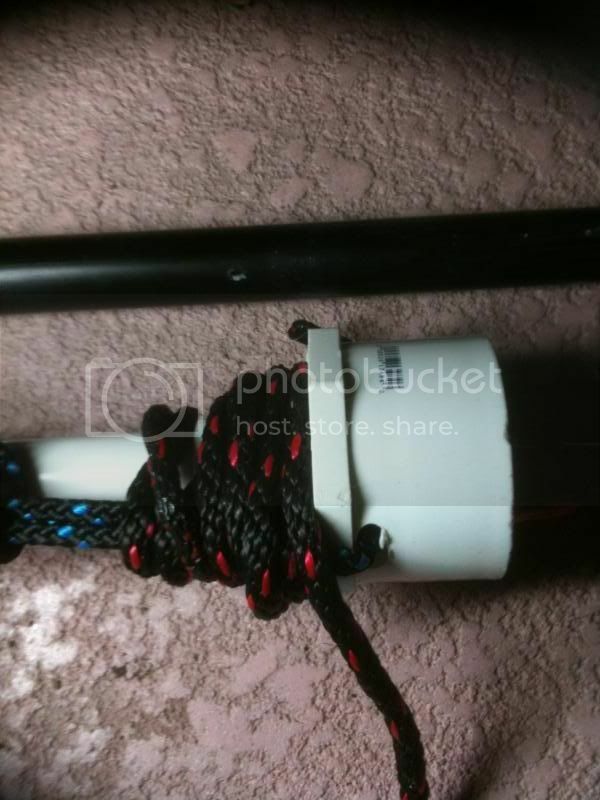 I am new to the AI forum and found your feedback on installing a furling jib very refreshing, creative and innovative! I live in San Diego where the winds most of the time are 5 to 8 knots so adding a jib would be exciting. Will you have a parts list and step by step directions for novices? i did not include all the individual screws and bolts that i used to attach everything together because some of the parts you may get may take a different size screw or bolt or require a different number of them. Last edited by S.Yoars on Wed Mar 10, 2010 7:30 pm, edited 1 time in total. Thanks as always for the information! 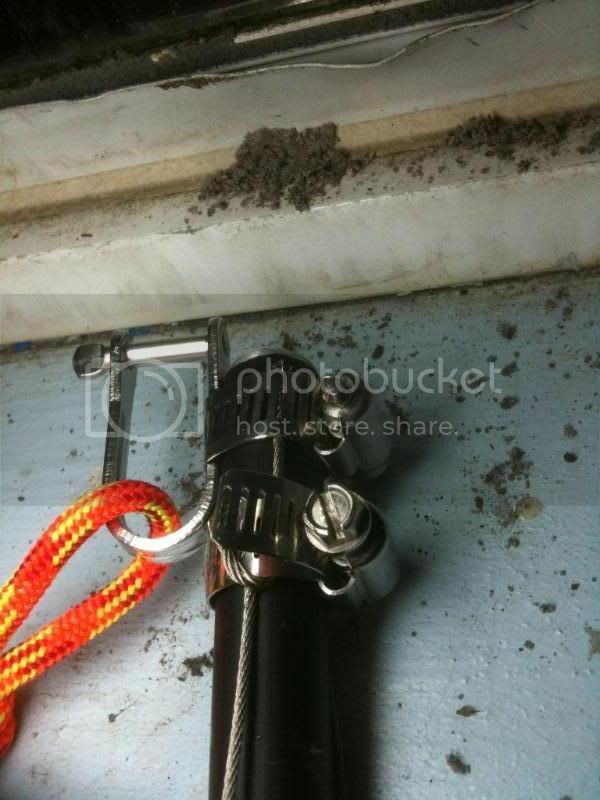 Sometime can you post a pic of the top of the mast with its clamp for attaching the stays? 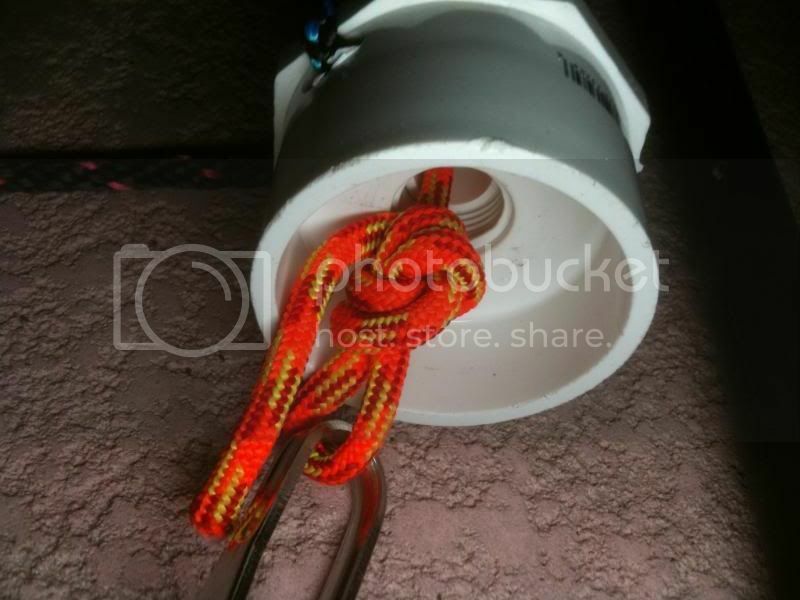 As well, can you clarify the mechanism and construction of the furler? the first picture is what it looks like when the jib is flying and the rest are of what it looks like when the jib is reefed. 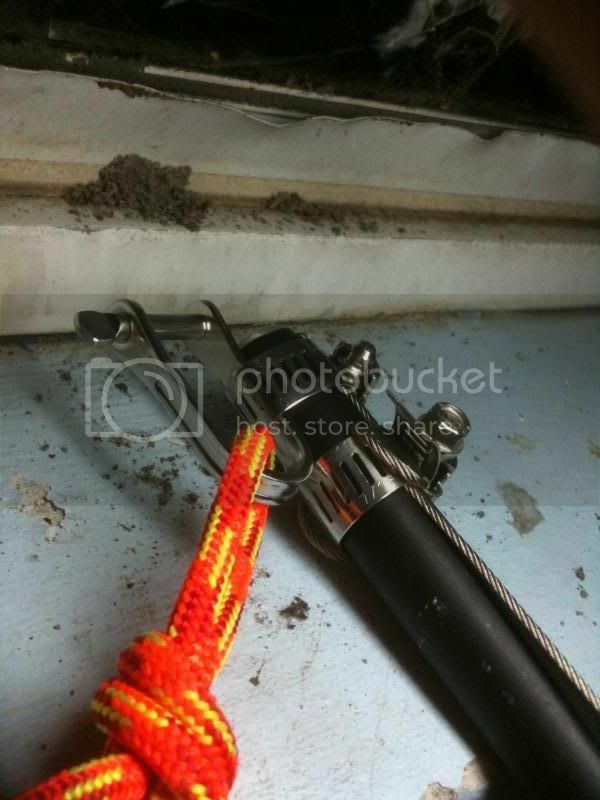 i also took pictures of the shackle underneath, this is how i attach the jib to the bow pad eye where the handle is. Thanks for such a comprehensive description of your outstanding jib design. im just glad that people like i!! 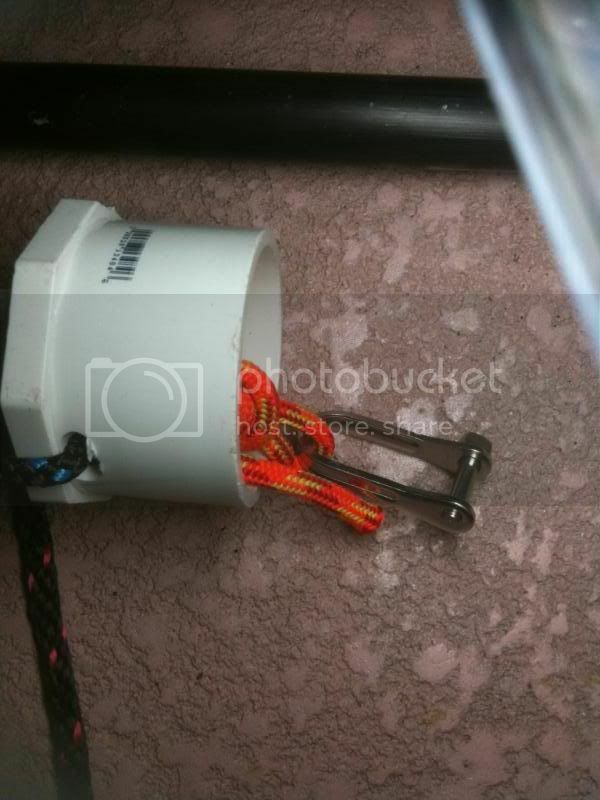 Great pics of the mast head connections and the furling system. I'm very impressed at the ingenuity in this. Hopefully I'll have my mast and spare hatch cover in a week more. Looking forward to getting started on this project! Hope your exams didn't get in the way of your sailing. Yes, Sterling, it looks like an excellent design and implementation. Very well done! The Hobie parts order arrived and we're off and running on our jib building project. Look out: here begins the questions! First, your parts list specified an 8 ft length of 1 inch pvc pipe to support the jib. Is it possible that the pipe should be a little longer than 8 ft? Perhaps 9ft? We cut a length to 8 ft but when we inserted it into the jib sleeve it appeared to be about 8 inches or a foot short of filling the entire sleeve. 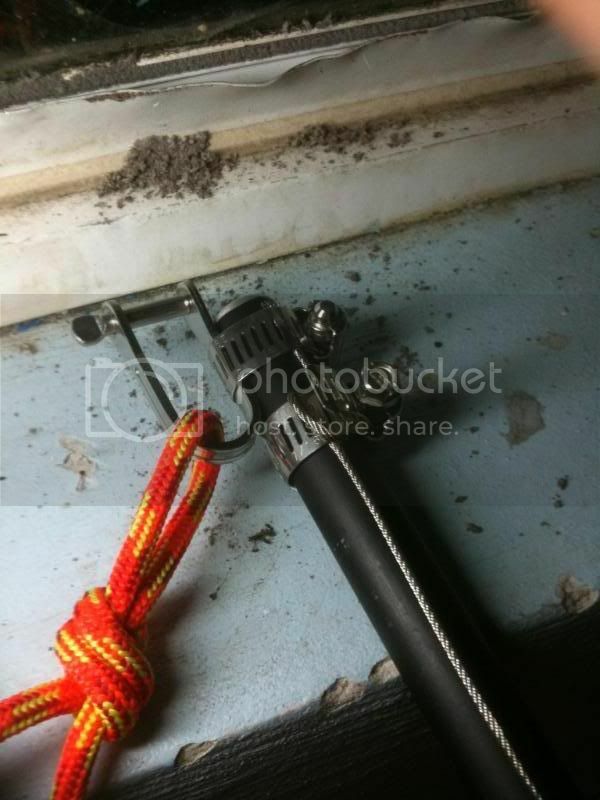 Second, the parts list listed a "flush mount hose bracket". The Lowes guy showed us a bunch of them in different sizes. Can you tell which size we need? as for the hose clamp, about 1/4 inch is the size I have but any size that will fit the turn buckles will be fine. Be sure to get the thickest you can ( which may require getting a bigger size) but any that are big enough to fit the turn buckle will work well. Be sure to post pics when your finished!! This is kind of basic but as I said at the onset, it is probably a stretch to say evern that I'm not much of a DIY person: any tips on the kinds of thru-the-hull fasteners you used for the attachment points of the mast receiver/turnbuckle/hook connectors, and for the pad eyes? Stainless steel nuts and bolts yes? With those nuts with nylon in them? Not screws? What length to go through the hatch cover? I'm assuming they are about a half inch long stainless stell bolts with washers and nylon nuts and coated with marine goop for the seal (never done that before but that's what one does right?). Does that sound right? Is there any reason you put the pad eyes on the Hobie parts list? Pad eyes are pad eyes, right? I forgot to order them from Hobie but I assume I could get equivalent pad eyes at west marine? You should charge for this course. Yeah spring is in the air up here in upstate NY. 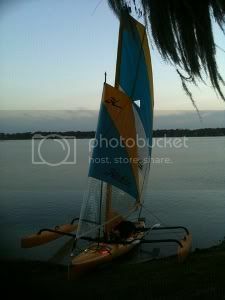 Hope to get this together to launch within the next two weeks for the first sail of the year. Provided I don't screw this up and mount the sail backwards and upside down I will certainly post pictures. As for the pad eyes from Hobie, they are made of chrome and are very strong, but you can find stainless or chrome ones at west marine. I'm having some trouble finding a 3/4 to 3in pvc adapter. 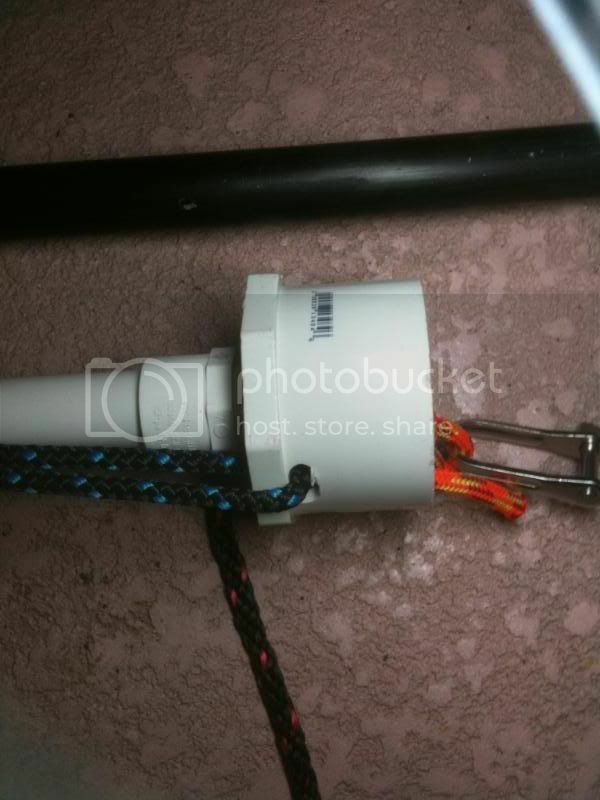 Is it possible that I have the sizes wrong or that the furler mchantism is formed of some kind of adapter plus some other pvc coupling parts? Regardless, what I'm after is something that attached the end of the 8ft 3/4in pvc pipe to a drum-like pcv fitting, probably 3 inches in diameter, right? How about the inside of the 3in part -- it is completely open space or is there some more complicated structure (I've seen these drum like parts both open space and filled).